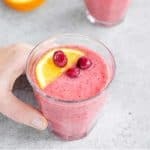 Healing Cranberry Smoothie! The perfect breakfast or snack to counteract all the holiday sweets! Packed with nutrition! Let’s balance things out a little bit, shall we? Since craving (and eating) chocolate, gingerbread & peppermint everything over the past few weeks, I’m ready for a little holiday break. This is typically the time of year when I start craving unprocessed, vegetable-filled meals. Don’t get me wrong, you know I’m not going to deny myself my favorite dishes; however, I find that I really do prefer produce-heavy meals most of the time. I notice a dramatic shift in energy and clarity when my diet is full of plants. As much as I want to enjoy the same feeling from extra-cheese pizza and cinnamon rolls, unfortunately, that’s just not the case. 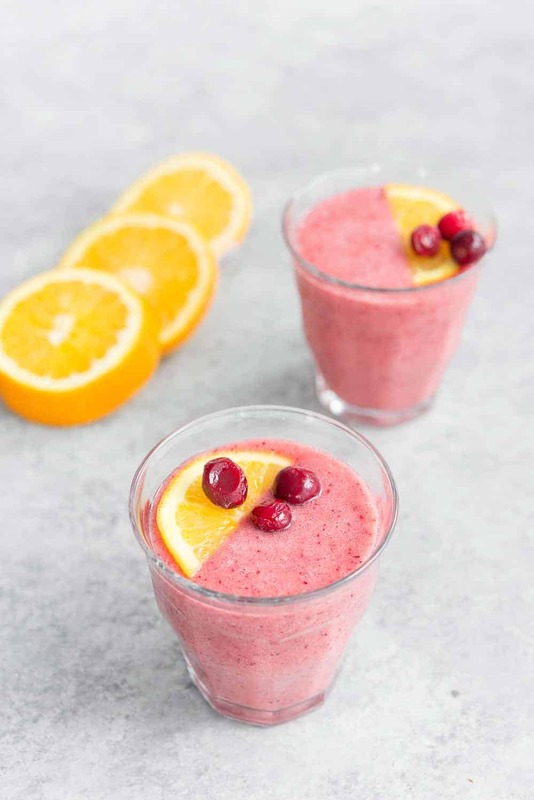 I first created this cranberry smoothie a few years ago when my freezer was overflowing with cranberries, and I was craving something sweet, yet nourishing. I wanted something refreshing, cold and seasonal. The combination of orange and cranberry is amazing to me. I love the tart berry and sweet, refreshing orange together. Smoothies are one of my favorite ways to get ‘back on track‘, but this time I wasn’t in the mood for the usual green suspects. How have I not put cranberries in a smoothie before? Orange and cranberry are the yin and yang to sweet and tart. Add a little banana for extra creaminess, and this is one smoothie you’ll be firing up the blender for day after day. Besides being ready in no-time flat, it’s become my favorite thing to sip after a hot yoga class. Plus, research shows that consuming the whole cranberry is more beneficial to your heart than taking concentrated cranberry supplements. Since fresh cranberries are so abundant this time of year, buy a few bags to store in the freezer! Keeping them frozen also negates the need for ice in this smoothie. I’ve included maple syrup in the ingredients, but that’s completely optional. My thoughts- the first time you make this, only add in a little or no sweetener. Then, if you want it sweeter, add a little more. Sometimes I like this pucker tart and sometimes I like this a little more sweet. Therefore, the maple add is completely optional! I shared with Vander a few weeks ago and he went gaga for it. So funny to see him love smoothies! 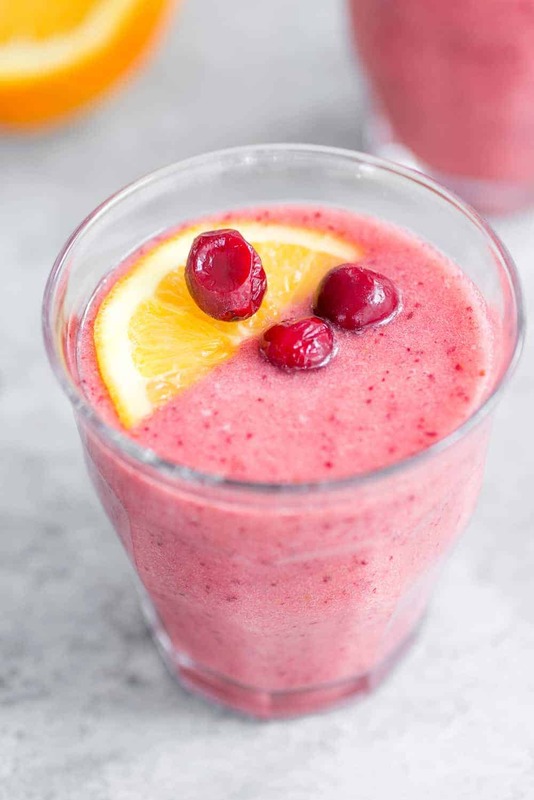 Healing Cranberry Smoothie! The perfect breakfast or snack after all the holiday sweets! Packed with nutrition! 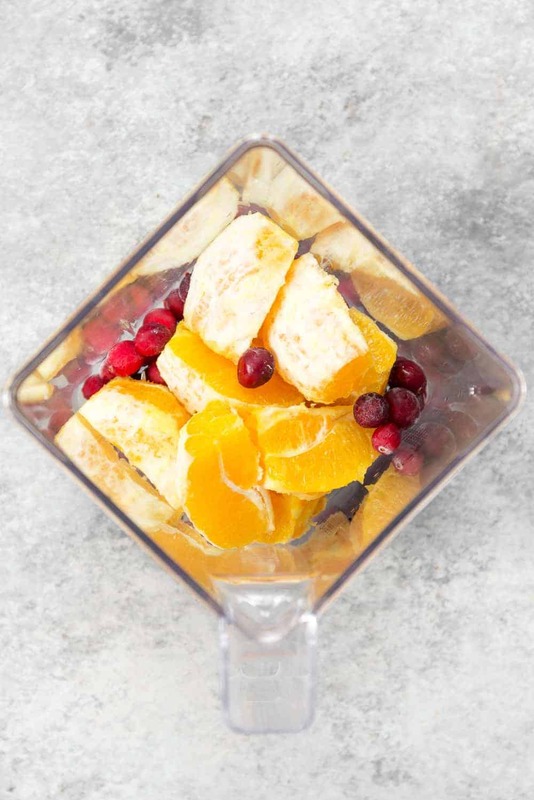 Place the ingredients into a high powered blender, like in the order listed: water, cranberries, oranges and banana. Blend until smooth and creamy. If desired, add in 1-2 tablespoons of maple syrup. Sometimes I want this more tart and sometimes I want things a little sweeter! If you are using a standard blender, you might need to puree a few times until smooth. A warning that this smoothie is a bit tart! While I love that sour/tart flavor of cranberries and orange, you may prefer it a little more sweet. In that case, add a little stevia, agave, maple, honey, whatever you prefer in with the ingredients. You can also decrease the cranberries to 1/2 cup. This sounds delicious. 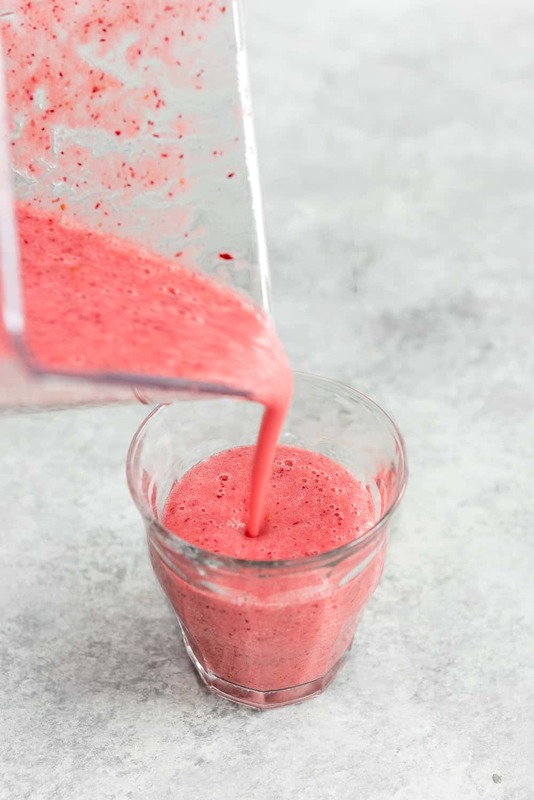 Cranberries are one of my favorite fruits so I’ll definitely be trying this smoothie. I love starting my day with a smoothie for all the reasons you talked about. Overall, it just makes me feel good. I’ve been stocking up on cranberries lately because I know they will be harder to find next month. Can’t wait to try this smoothie! It makes such a difference doesn’t it? Smoothies are my favorite way to say good morning! I was thinking the same exact thing last week: why have I never put cranberries in a smoothie?? They were the perfect tangy complement! I need to remember that for the future… And buy LOTS of cranberries to freeze in the meantime! Pinned! My freezer has cranberries runneth over! I’ve been popping them into other smoothies as well over the last few weeks and love the tart flavor! It’s a much better alternative than my traditional cranberry love- jam on everything! Ooh, this is so pretty! Lovely! That looks so pretty! Love cranberries and oranges together! So fresh! I just love the color! Yum! 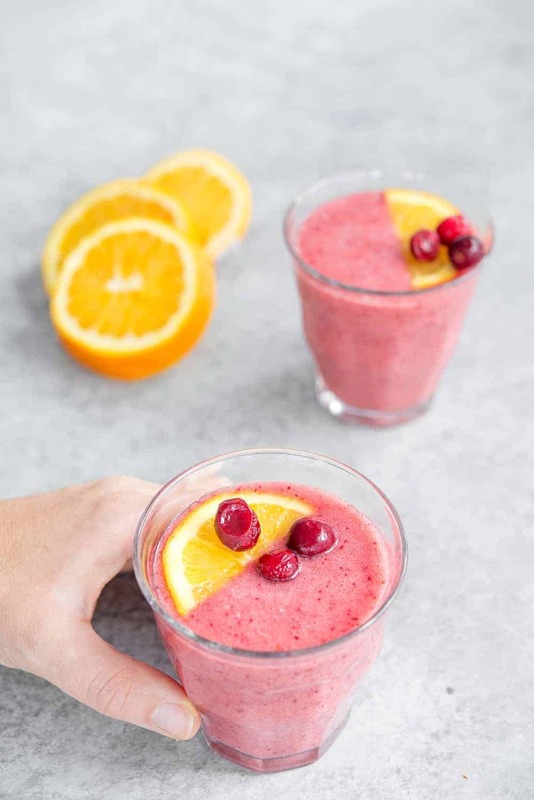 This looks delicious – and banana would be the perfect addition to take the edge off that cranberry tang! 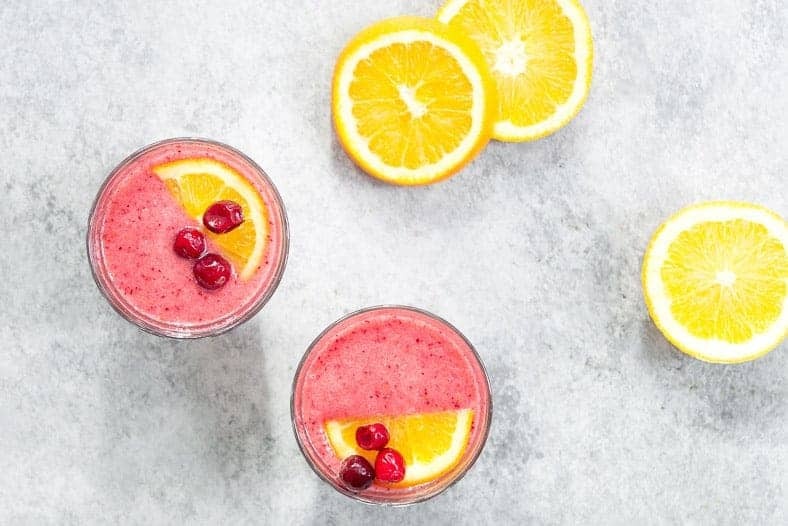 cranberries in a smoothie does sound delish. I like how you’ve just used fruit and water and not added any other crap that I see in a lot of smoothies. Yum! Sorry you’ve been in a funk! I can always tell when my eating habits are off by my mood too. This smoothie is beautiful! I made this. It was yummy, but way too sour so I added Stevia and it was great! Thanks for commenting! So glad you tried it! Stevia sounds like a great addition. I made this smoothie today and it is so good!!! It was perfect for me, just the way the recipe is. Thank you for sharing. It will be in my smoothie favorites. Awesome! Thanks so much for the comment Wilma, glad you liked it! Really like this smoothie. It’s tart, but very refreshing. When I make it for my kids, I add in a little more orange and less cranberries.